Gor Mahia are upset with the Kenyan Premier League (KPL) for barring them from signing two players ahead of the second leg, which kicked off last weekend. Gor could not field former Tusker forward Itubu Imbem (pictured) and Osca Mbugua formerly of Nairobi City Stars against Western Stima on Saturday after failing to get clearance from the league company in time for the restart of the league. Club secretary George Bwana said the action by KPL was unfair and unwarranted. “We did everything as per the rules and are shocked that KPL has declined to approve our signings as it ought to be,” said Bwana. Bwana dismissed reasons given by the company that one of the players Mbugua has a running contract while Imbem lucks a work permit. “We have evidence that Mbugua is no longer a City Stars player after we paid his club a transfer fee while Imbem got his permit two years ago and we have been informed by the Immigration department that it is still valid and can be used,” said Bwana. Bwana sees KPL’s action as sabotage and said the club is considering other options on dealing with the matter. But KPL Chief Executive Jack Oguda insisted that the club must get a new work permit for Imbem if they want to use him during the league’s second leg. “Our rules are very clear. Any club that acquires a foreign player must get a work permit for them even if they did have one with another club and this is what Gor ought to do if they want to use the player,” said Oguda. Oguda also said that Gor couldn’t be allowed to sign Mbugua because they have already signed the maximum number of players required during this transfer window. Kenyan Premier League side Gor Mahia have parted ways with Cameroonian striker Baldin Ngwa and subsequently offered him for sale. Ngwa has been released only four days to the close of the transfer window, six months after rejoining Gor Mahia from his stint in the Tunisian League. Ngwa had played for Gor for the whole of the 2010 season, where he was in red hot form alongside George Blackberry Odhaimbo playing an integral part in the team’s second place finish. According to the team’s official website, Ngwa has agreed to leave the club through mutual consent after holding a meeting with club officials. The Club Website says that “the club’s decision to put Ngwa on sale has been occasioned by the fact that having him would have meant Congolese Itubu Imbem was not going to be signed as per the Kenyan Premier League rules on the number of foreign players per club”. “It is sad we have to let him go. He has been a diligent servant of the club and K’Ogalo family will definitely miss him. But we have to adhere to the requests of the technical bench,” adds Bwana. Ngwa’s exit had been long coming from afar since the coming in of Coach Zdravko Logarusic. He has seen minimal playing time and he was always under fire from the Croat as he could not fully execute his game plan when he played. With four days left before the transfer window closes, Ngwa is faced with a huge task looking for a place to settle with most clubs almost concluding their transfer business. Indeed both goals came via new signings who combined well with regulars like Rama Salim and Moses Odhiambo. Gor Mahia controlled the proceedings in the first half but could not break the deadlock because Stima gave a good account of themselves in defence and midfield. In the second half, Anthony Akumu was introduced for Ali Abondo, a change which strengthened the Kogalo midfield. Only two minutes in, Moses Odhiambo sent a low cross which Joseph Njuguna calmly tapped home for Kogalo’s first goal. Rama Salim combined well with Njuguna whose shot was parried for Ugandan Dan Sserunkuma to ram home for the second goal . Stima came back into the game strongly and reduced the arrears on 81 minutes from the penalty spot. Gor Mahia has completed the signing of six players in the June transfer window. The players include: Joseph Njuguna, Edward Mubiru, Nick Auma, Antony Gathu, Itubu Imbem and Dan Sserenkuma. On the other hand, three were released on Monday. Joseph Kiplagat, Duncan Owiti and Ibrahim Kitawi ahead of the second round of the league that resumes this weekend. Croat Zdravko Logarusic has said the main of the signing is to improve their squad. Club secretary George Bwana has termed the changes as necessary for the club. Ibrahim Kitawi, John Kiplagat and Duncan Owiti “macheda”, 3 players who were part of the youth brigade recruited by James Sianga, have been released by the club. In comes Itubu Imbem the former Tusker striker as Gor Mahia try to sharpen their attack which has been blunt. Imbem has signed a one year deal. According to club officials, the trio have rarely made it into the squad of 18. It is therefore in their interest to be released. This writer thinks the three will flourish. Owiti in particular if given a run of first team matches to gain his confidence could end up being one of the top scorers in the league. he has in the past shown a knack for finding the back of the net. Teenage sensation, Anthony Gathu who previously played for Mt Kenya University has shown signs of brilliance and earned praise from coach Bobby Ogolla. Kenyan Premier League (KPL) giants Gor Mahia have distanced themselves from the comments made by the team’s Croatian coach Zdravko Logarusic over the Harambee Stars job after a run of poor outings by the national team. The coach, in an interview with futaa.com had claimed he is well qualified to coach the national team, further adding that if the Football Kenya Federation (FKF) wants a foreigner as a coach, it needs to look no further. His sentiments however, have not been well received by the club’s executive wing. The vice chairman Faiz Ochieng has been infuriated by the comments, claiming the team’s fans are up in arms over the comments and adds that the executive will consult and give an official stand over the comments. -We are distancing ourselves from what the coach said. It should be first and foremost understood that the coach is an employee of Gor Mahia and the brand called Gor Mahia should not be dragged into such a mess. He has no mandate whatsoever to make such a move. -It is so demeaning to the club and all our fans because they are calling us from all over complaining about his comments to the media. Let me put it very clearly that his job in Kenya is only to coach Gor Mahia. We are going to consult as the executive and give an official statement over the coach’s comments, an irked Faiz told futaa.com. The Croat has been making clear his dissatisfaction at the national team’s performance since they played Malawi and managed a draw in the 2014 World Cup qualifiers in Nairobi three weeks ago. Among the new players paraded on Saturday evening by Gor Mahia in the friendly against Tusker, most were young players who were being tested on hot grounds by Coach Zdravko Logarusic. Only two; Imbem Itubu and Serenkuma Danni were old guards who have been in the league. Coach Logarusic threw in four young players whom he hopes will spark life for his K’Ogalo side and especially for a strong future. Antony Gathu was picked from Thika side Gatundu FC which plays in the nationwide league and he impressed Coach Logarusic though he is yet to hit his excitement nerves. Young Eddy Mubiru from Uganda who was voted the best player in last year’s Kenya National Secondary School games was also handed play time. Another relatively new player was Francis Oduor, who has had stints with Tusker and also gone for trials severally in Denmark. According to Team Manager Tom Ogweno who was instrumental in identifying the players, they are talented and have a great future with them. He hopes that they will impress the entire technical bench and earn a berth in the team. There was no Gor Mahia player who saw action as Harambee stars went down 0-1 to Togo minus Emmanuel Adebayor. 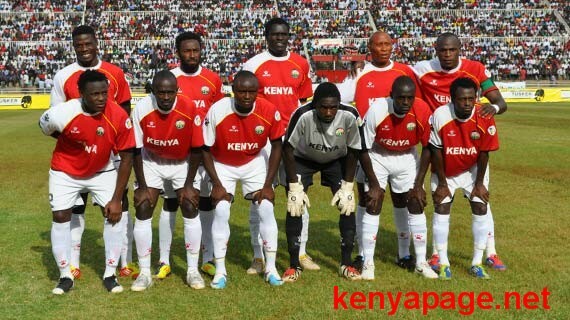 The loss saw Harambee stars eliminated from the 2013 Africa Nations cup. Matchwise Togo had the upper hand in the first half forcing several saves from Arnold Origi. Kenya came into the game briefly in the second half. The goal that sunk Kenya came in the 59th minute via a long range effort from Serge Gakpe. Kenya’s elimination does not come as a surprise. The national team has been rather unimpressive of late. The calibre of players currently featuring for the national team is the lowest that most Kenyans can remember. Starting XI: Arnold Origi, Jockins Atudo,James Situma,Brian Mandela,Joseph Shikokoti,Kevin Kimani (Jamal Mohamed),Victor Wanyama,Collins Okoth,Dennis Nzomo (Patrick Osiako),Patrick Oboya (Paul Were),Dennis Oliech. Kenyan Premier League defending Champions Tusker FC and Gor Mahia fought off to a barren draw in normal regulation time thus occasioning penalty shootout that Gor Mahia won 3-1.The friendly match was played at the City Stadium on Saturday afternoon. Both coaches, Zdravko Logarusic and Sammy Omollo, used the match as a build up to evaluate the preparedness of their teams ahead of the second leg of the KPL as well as being a good testing ground for their new signings. Coach Logarusic threw in his new dices starting former Tusker and AFC Leopards man Itubu Imbem as well as immediate former City Stars top talisman Dan Sserunkuma. Tusker on the other hand had a completely differnt face in the back four with their players being away on national duty. Both teams approached the match coolly with none throwing all the weight. Tusker were the brighter side in the encounter with Peter “Pinchez” Opiyo and Jerry Santos commanding the pace of the game from the midfield. Patrick Kagogo had a decent effort in the ninth minute but keeper Jerry Onyango collected the ball with ease. Teddy Akumu had an effort for Gor Mahia in the 27th minute but his long range shot went agonizingly wide. Approaching the half hour mark, the game’s tempo began to gradually pick up. Tusker keeper George Opiyo standing between the sticks in the absence of Boniface Oluoch was called into action in the 34th minute, making a spectacular save from an Itubu Imbem shot after a defensive clearance hit Danni Serunkuma. Gor then made the first sub of the evening Jerry Onyango coming off for Ivo Mapunda. Opiyo was then forced into his second sub of the evening with another fantastic save from an Ivan Anguyo freekick. Come the second half, Tusker changed their entire team, with Coach Pamzo swinging in his new signings in David Nyanzi and Allan Katerega. Coach Logarusic re-strategized by bringing in a few new faces including Eddy Mubiru, Edwin Lavatsa, Yussuf Juma, Nasio Solomon and George Midenyo. Play was minimized into midfield battle with the two keepers having nothing much to do. Tusker were again the brighter side with Katerega and Nyanzi tormenting the Gor backline. Gor also made some chances in the Tusker 18-yard area but the ball never found its way into the net. After the 90 minutes with the game still at 0-0,penalties were to be used to decide the winner .Gor Mahia’s Ivans Anguyo,Kevin Omondi and Duncan Owiti converted theirs while Charles Ondete and Dennis Mukaisi were not lucky for the brewers.Maurice Odipo managed to score for Tusker to make it 3-1.